Welcome to the HEATED Lab! We study heat and electron transport in nanoscale devices, interfaces, materials and composites, with the aim of improving the energy efficiency of electronic devices. 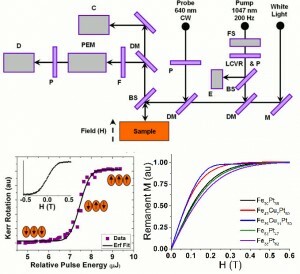 We are also interested in spectroscopy and optical pump-probe techniques for the characterization of materials and magnetization dynamics near phase transitions. We are associated with the Nanotechnology and Biotechnology Research Group at York University. Our lab is home to LUTher (Laboratory for Ultrafast Thermo-magnetics), a CFI-funded infrastructure for the study of ultrafast phenomena taking place in magnetic materials at high-temperatures, particularly near the Curie point. We have applied frequency-domain thermoreflectance (FDTR), an optical pump-probe technique, to the study of heat transport in nanostructures. To enable sufficient sensitivity over such small length scales, we have developed means to extend the modulation frequency of FDTR to ~200 MHz. For the study of heat transport in anisotropic materials, beam-offset FDTR enhances our ability to detect in-plane heat transport such as in the case of one-atom thick graphene layers. We recently worked on a method to measure the Curie temperature distribution in magnetic media, particularly for FePt nanogranular media, where this dispersion can severely hinder the achievable data storage density in heat-assisted magnetic recording. You can read more on this here and here. These devices were developed as an alternative magnetic field sensor concept. They can be fabricated at the surface of a sample, contrary to sensors based on 2D electron gases, enhancing the spatial sensitivity. EMR sensors do not include any ferromagnetic materials so they are impervious to magnetic noise. For more see these two papers. 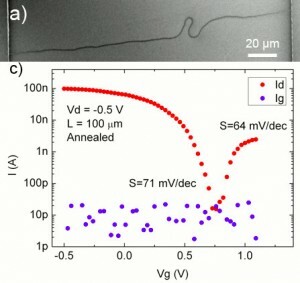 We have investigated means to efficiently switch transistors made from single-walled carbon nanotubes. Particularly we have matched work functions at metal contacts with large-diameter nanotubes and used top-gates with higher-k dielectrics to obtain switching efficiencies near the thermal limit or beyond, by band-to-band tunneling. 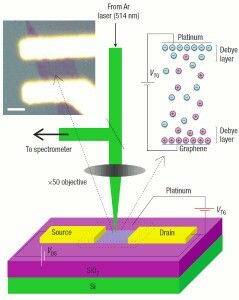 We have investigated the effect of charge doping on the Raman spectrum in graphene transistors. Doping was achieved by electrostatic bottom-gated and polymer electrolyte top-gated approaches. These studies show how Raman spectroscopy can be a sensitive measure of doping, and reveal strong non-adiabatic effects in the electronic state of graphene layers.